Kitchens Lanarkshire are your local recommended kitchen installers who regularly receive positive customer testimonials. After fitting hundreds of kitchens across East Kilbride, Cumbernauld, Motherwell, Hamilton and the whole of North and South Lanarkshire we’ve built an excellent reputation. Constantly striving to give each of our customers the very best level of service possible, we are proud of the reviews our previous customers have provided. There is a selection of customer reviews listed below, previous kitchen installations are available to view on request. Contact Kitchens Lanarkshire today to arrange a free kitchen design survey. Review: Urie – Strathaven. Mr Urie from Strathaven (ML10), South Lanarkshire bought his property around 25 years ago. Understandably his 25-year-old kitchen Read More…. 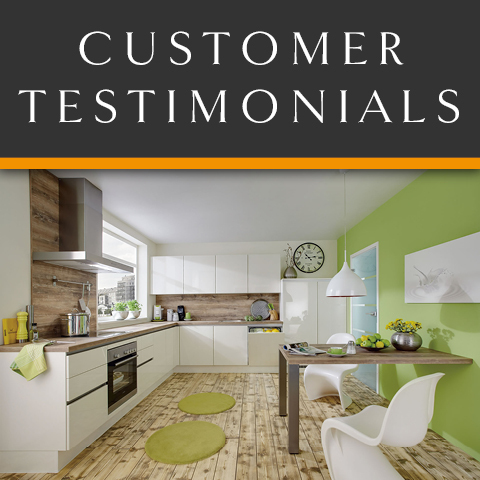 Brannan – Motherwell: Kitchens Lanarkshire provided an excellent service when we chose them for our fitted kitchen. Tradesmen were highly skilled and kept our home tidy throughout the kitchen installation. Highly recommended, thanks! Moore – Coatbridge: What more can I say! From our free kitchen design to our complete fitted kitchen the process was on time. I changed my mind at the last minute with a different worktop, kitchen installers made sure it was still fitted on time. Paterson – Wishaw: Very helpful even when things go wrong, our integrated fridge freezer wouldn’t work properly on the day of handover. Kevin the installation manager had it changed over within a few hours, first class recommended service. Trower – East Kilbride: We found Steve to be most informative and helpful, they don’t offer kitchens on finance but pointed us to our bank. We sourced the funds from our bank at a better rate than other kitchen companies, great service! Lawrie – Hamilton: We chose a local kitchen specialist when deciding on our new kitchen. Douglas the kitchen designer managed to squeeze in everything we wanted into the available space. Really happy with the end result, thanks boys. Watt – Cumbernauld: I came to Ian’s company as they were a considerable amount cheaper than a large well known kitchen showroom near me. Although money isn’t everything it was more affordable and they supplied better units than anywhere else.